By June of 1977, with the start of The North Head, our 14th house, we were beginning to get down the vocabulary of Victorian. Noel came up with 3-point design of two gables with a tower between, plus a showcase chimney, that established the basic components for a handful of commissioned projects, as well as our Tower House kit for do-it-yourselfers. 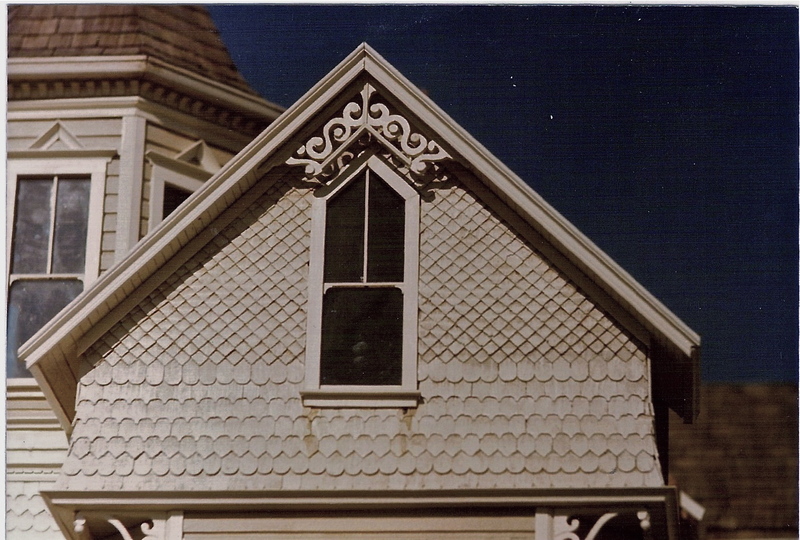 While Noel devised the intricate chimney brick pattern, I cut and applied endless rows of decorative and roofing shingles. The radio kept us entertained (and somewhat sane) with Jimmy Buffett’s Margaritaville (the ridiculous) and Hitchhiker’s Guide to the Galaxy (the sublime). That same month Seattle Slew won the Triple Crown, the Alaska Pipeline opened, and Apple II, the first practicable personal computer went on sale (as long as you had a TV for a screen and could run audio tapes). The North Head was destined for Hawaii, and our enthusiastic client plied us with packets of chocolate macadamias and Kona coffee via the post office. We experimented more with aging details—breaking out some of the lattice under the house (where the dog went for shade), more wear and tear on steps and staircases, and a few more stains under the window ledges. While we were known for our aging techniques, it would be a while before customers would encourage us to do more. Noel developed his black wax formula for floors—Johnson’s paste wax mixed with cigarette ashes (yes, it smelled awful–eventually we replaced the ashes with Mars Black tube acrylic paint). It was applied after the floors were stained and laid, hand-rubbed in with a darker build-up left in the corners. It was one of those largely unnoticeable details that made a room feel real. It seemed to register in the sub-conscious of the viewer as evidence of human occupation. For us it took “the new” out. We added glass etching to our repertoire, which allowed us to embellish the houses even more—by then we were totally immersed in Victorian ornamentation. Jim Marcus introduced us to the wonderful gelutong, a dense wood, similar to basswood, but with almost no grain that allowed Noel to cut intricate gingerbread shapes on the scroll saw with minimal breakage. One of my favorite elements was the glassed-in back porch off the kitchen, very close to the sunporch on the front of our own house, where we ate dinner during the summer. Late nights after we finished work, Noel often stayed up and just looked at the house, waiting for new ideas. One of those brainchilds came from noticing a hatch of baby spiders on our front porch, which he moved to the attic of the miniature house, then closed the door to the studio and came to bed. The next morning I opened the door to find the entire studio webbed–little white threads connecting the house to the ceiling, worktables, spare wood strips, tools and bottles of glue—everything linked to the next. And yes, the attic had tiny, in-scale webs strung across its ceiling. 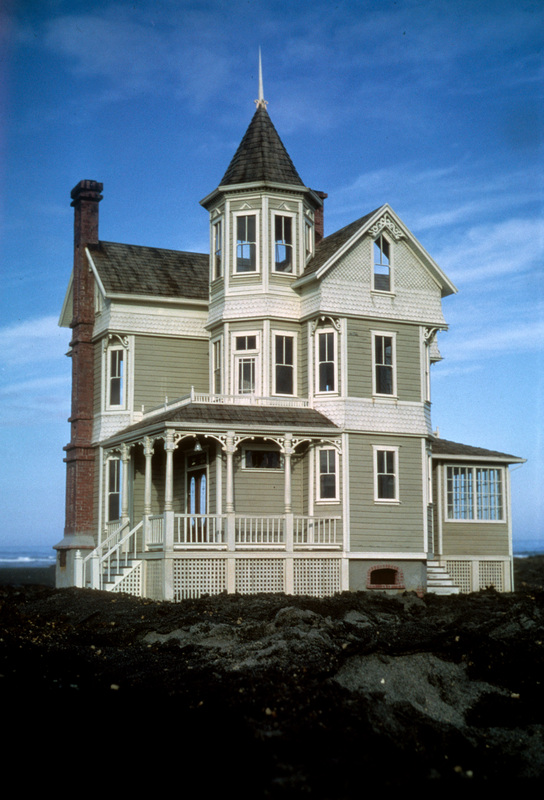 This entry was posted in Houses, Miniatures and tagged black wax, gelutong, Hawaii, Hitchhiker's Guide to the Galaxy, spider webs, Victorian architecture. Bookmark the permalink. 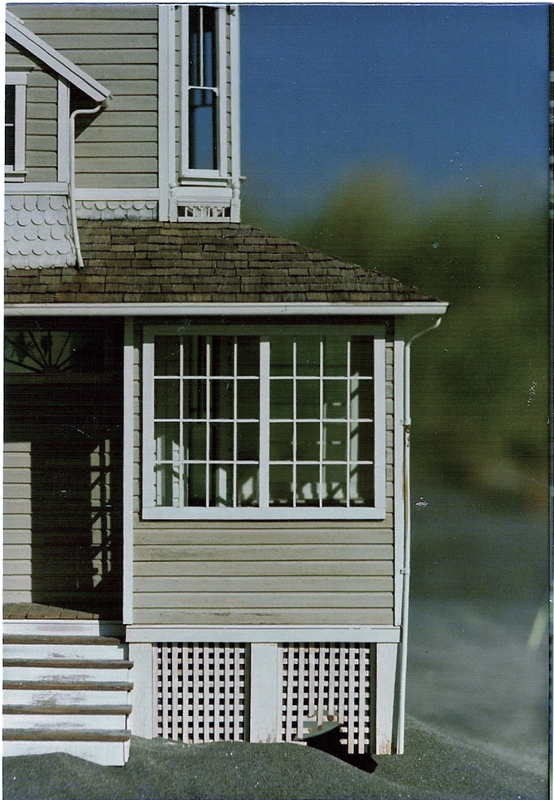 I have not seen photos of this house before. Love the details and the gull grey and white color. I recall you made a Hawaiian bungalow too. Was it for the same customers? We never made a Hawaiian bungalow, though that would have been a good project. We did make a Hawaiian fruit stand for the same customer, after a euphoric visit to Hawaii, and then another one for ourselves.